New York based artist Jeanne Jalandoni creates art with a focus on culture and identity, art that relates to being Filipina American. Growing up with an eye for creativity and encouraged by her parents, Jeanne worked on art in high school and college, graduating with a BFA from New York University in 2015. Jeanne’s work, in oil paint and fabric textiles and metal and plaster, is a way to connect to her identity as a second generation Fil Am, referencing details and symbols familiar to Filipinos such as food (lumpia, mango, flan) and fashion as well as family stories and folklore. Jeanne’s art is a communication for who a Filipina American is, and she part of Dogeaters Collective, a New York City based group of creatives premiering their first art exhibit “The first Picture of You, 1990” April 22-May 3 at the Philippine Consulate in New York. How did you create your career path and were you always interested in art? I was always drawing ever since I was a toddler. My parents have photographic evidence of me scribbling on walls, my body, and my toys. The amazing part was that they didn't tell me to stop. My dad is a photographer, and he would let me take photos on his fancy cameras as a way of learning about what he does. He saw from my photos that I have an eye for creativity and him and my mom would buy me sketchbooks and coloring books, craft items. Being immersed in art early on definitely made me interested in creating, but I never thought of art as a career path. It was more of a hobby that got me into an arts high school, (LaGuardia HS), and New York University. I thought it would be fun to make art on the side while studying academics and thinking about what I really wanted to do. At some point in college I was like, “Whoa, THIS is art? This is what I signed up for?” and it was exciting because it was risky, but also terrifying because it sounded like success really hits in your 40s and 50s. But I never realized art was an important way for me to communicate and translate ideas, and use it as a powerful tool. After graduating in 2015, I wasn't sure if I wanted to keep pursuing art, but I remembered my professors stressing how important it is to continue making work and to not take long gaps between projects. I told myself that while I figure things out, my one consistent will be to make one painting a month and build a stronger portfolio. My weekly schedule was very art intensive: visit museums, sketch, see galleries, sketch, make paintings, sketch, document work, apply for opportunities. Very rinse, wash, repeat. It was terrifying because everyone around me seemed to be doing what is expected after college-- getting a 9-5 and buying their first apartment. Art school was intense, mostly because it felt like people were always looking over my shoulder and I would make work to earn a good grade and critique. I hated that feeling. I definitely needed time to think about what I wanted to do and what was important to me. Having that foundation and alone time post-college, gave me the confidence and motivation to keep being as active as I could in the art world, while maintaining my voice. I'm mainly inspired by stories--- family stories, history, folktales. Even other art forms, like music, movies, theater, and cooking/baking help me think about ways of approaching my work. All these things are aspects of culture and my personal narrative. I also easily get captivated by very simple objects, colors and processes. Like I remember as a toddler I had a phase where I loved rolling up broken, thick rubber bands, and would amuse myself on long train rides rolling and unrolling a rubber band. I think I was proud of myself for finding a new purpose for a rubber band. Even jingles, train advertisements and corny commercials serve as inspiration! They are part of the backdrop of the culture I grew up with, and visually they are effective ways of communicating ideas. So I think about images and combinations that can read quickly based on how culture is consumed. How does your identity as a Filipino American influence your art? At first I was disinterested in making art about my Filipino identity because I felt that I was participating in the exotification of the Philippines, especially as someone who has no experiences being in the Philippines. But now it has become important for me to make work about being Filipino-American because I never knew how to define it and I thought the best way to do that was through creating images I could relate to. Growing up, I didn't know many Filipinos, and the ones I did know had very different experiences and associations than I did. Because of that, I would keep saying I wasn't Filipino enough and I was only American. Even my parents affirmed I was American; I’m not Filipino-- being born in New York, not being able to speak Tagalog and only half-understand it, never traveling to the Philippines, and being raised mainly by American culture. Who am I to know anything about what it means to be Filipino? But because Filipino is inherited, I am Filipino-American, and my art aims to prove that statement. The main thread throughout my work is identity, with a focus on culture. I tend to work with figurative imagery and food. 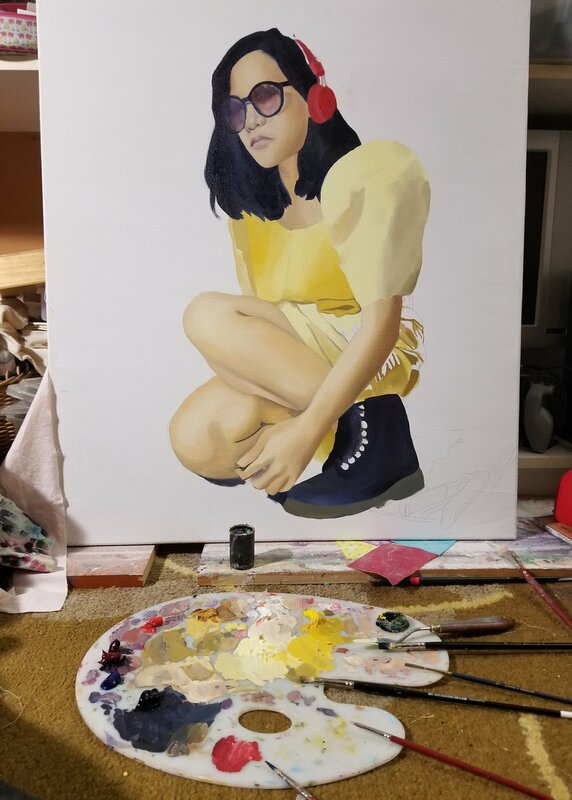 A few years ago I started using myself as a model for my paintings because I wanted to see paintings that celebrated a Filipina American that I could relate to. I started out with a fear of making work explicitly about how I saw myself as a Fil Am, so I just began using myself as a prototype for a "Filipina American" character, and ending up developing a bit of a mythology around who the Filipina American is. I’m really interested in the idea of painting two women to personify my American side and my Filipino side, and referencing old photographs to flesh out new meanings. In paintings where there's one figure, it's usually a woman with a carabao (water-buffalo) head, who represents the positive characteristics of Filipinos as hardworking, strong, and graceful. Additionally I investigate my ancestry through paintings and have this belief that the more work I make about family members I never met, the more I can piece together the kind of person they might’ve been. Being aware of my relationships or lack of, with certain family members, definitely impacts the way I view my identity as someone who holds responsibility towards sustaining culture and tradition. Besides oil paint and fabric, I really enjoy working with metal, and plaster. I’m not the best when it comes to storage space, so I tend to avoid making sculptures because of it. I’m low-key getting back into it with small sculptures though. But I do prefer being very hands-on when making art, which is also why I enjoy stitching fabric to my canvases before stretching them. I’ve also been working with Philippine snack bags and stitching that to canvases. There’s something really pleasing about seeing items, like snack bags, being stitched because they don’t necessarily belong together, but the addition of thread turns it into a craft object or something that looks like it has a purpose. I love little details like that! Do you have any favorite pieces or shows you have participated in? Ooph, that’s like choosing a favorite kid. Well, the one piece I am very eager to show is a painting I made some time in Fall 2018, “Take Up the Brown”. It’s the start of a new trail of ideas around Fil Am identity in America, and nods to US imperialism in the Philippines. I also love it because it combines a range of painting techniques, which was very new for me. One of my favorite shows I participated in is happening right now, "Super Sarap" (March 15- July 21) at Asia Society Texas Center (Houston, TX), guest curated by the wonderful Patricia Cariño Valdez. A smaller version of the show first debuted at Erica Broussard Gallery (Santa Ana, CA), and more pieces were included in the Asia Society exhibit. I really enjoy this show because it's the first time I'm exhibiting only textile pieces, and I am in the company of inspirational FilAm artists who make brilliant work in very creative ways (Mik Gaspay, O.M. France, and Charlene Tan). And all the work is about Filipino food and how we think about food's role in defining culture. Personally, I grew up learning about Filipino culture through food and my parents’ stories around snacks and dishes, so it was very meaningful to be part of a show that was explicit in examining food’s relationship to Filipino identity. What are some reactions of other Fil Ams to your work and it's nuanced details? Reactions have been very positive, curious, and amused. I've also heard feedback that my work is very Filipino and celebrates being Filipino. That makes me feel a little uneasy because I don't want to seem like I'm trying to speak for all Filipinos and say, 'This is what it means to be Filipino!'. I'm only speaking from my experiences and drawing out personal and Philippine/Fil Am history that I find interesting in thinking about bicultural identity. One of my favorite reactions was to a painting I did that included a spam can, and it was showing at an NYU alumni show. The spam can caught a student’s attention and she reached out to me, saying how happy it made her to see Filipino representation on her campus. It was really heartwarming because I’m probably the harshest critic of my work and I’m always nervous about putting my work out there. Getting feedback like that is so rewarding because it’s a gentle reminder that if something is important for you, then it must be important for someone else. I hope that people can find something relatable and learn something new about Fil Am identity and their own identity. My experiences are also not only relatable to Fil Ams/Filipinxs, but I hope that I've created some representation for that next generation of Fil Ams who need to see themselves in the arts. And also that it's okay to not fit into one mold for any identity, and that your identity is unique to you. Just embrace it and learn from it. Can you share more about Dogeaters? How did the concept come about? How important is it to celebrate the Fil Am community? Dogeaters is an art collective, made up of Fil Am artists and writers based in New York City. Back in June 2018, I was curated into a small, powerful Fil Am show in Brooklyn, titled, "Bundok Saints" (curated by andie millares). It was so exciting because I knew some of the artists from instagram and the Filipino American Artist Directory, and it was insane to finally meet and show together. Afterwards I pitched an idea for a FilAm show at the Philippine Center New York and invited some of the artists to help organize it. Additionally we began discussing other projects and agreed to form an art collective to continue producing shows together. Now we have a confirmed spot at the Philippine Center, and will be debuting our first project, entitled, "The First Picture of You, 1990". It will be on view from April 22-May 3, and it will focus on the range of experiences of 15 East Coast Fil Am artists. A lot of Fil Am experiences in the media tend to focus on West Coast Fil Ams, so we wanted to shed some light on various individual East Coast experiences. It's very important to celebrate the FilAm community because people need to know how multi-faceted Philippine identity is. The Philippines has a rich culture, a fascinating history, yet Filipinos and FilAms tend to get neglected from history books. The first Asians to set foot on American soil were Filipinos! I think it’s about time we invite others to participate in learning about Philippine/FilAm culture and history. By celebrating the Fil Am community, Fil Ams get the opportunity to teach others about who we are and deconstruct stereotypes and generalizations. Do you have other upcoming projects or shows you are excited about? I recently received a grant from LMCC (Lower Manhattan Cultural Council) to organize and curate a show this Summer, entitled, "Cultural Cousins". It will feature works by emerging and established Latinx and Filipinx artists and focus on how we have a lot of things in common culturally. Last year I had read "The Latinos of Asia" by Anthony Christian Ocampo, and was thinking a lot about the idea of how the Philippines is technically part of Asia, but Filipinos share many things in common with Latin American. I want to draw this out in the show, and use it as an opportunity to discuss the effects of colonialism, and how cultural identity challenges racial identity. I don't want to reveal too much about the show yet, but I'm already learning so much about how the Spanish rewrote traditions and redefined status in their colonies. It's disgusting. In addition to learning about cultural similarities on a global scale, I'm hoping this show will encourage others to decolonize their minds.